Botswana is endowed with stocks of natural resources; minerals, energy, protected areas, crops, pastureland and non-timber forest products, which account for one-third of the country’s total wealth and underpin several important contributions that drive the economy such as nature-based tourism, mining and agricultural activities. Tourism is a significant contributor to the country’s economy (7.5% contribution in 2008 and 8.5% in 2014, expected to rise to 10.5 % in 2025 (www.wttc.org) and drives the need to strengthen conservation efforts in biodiversity. 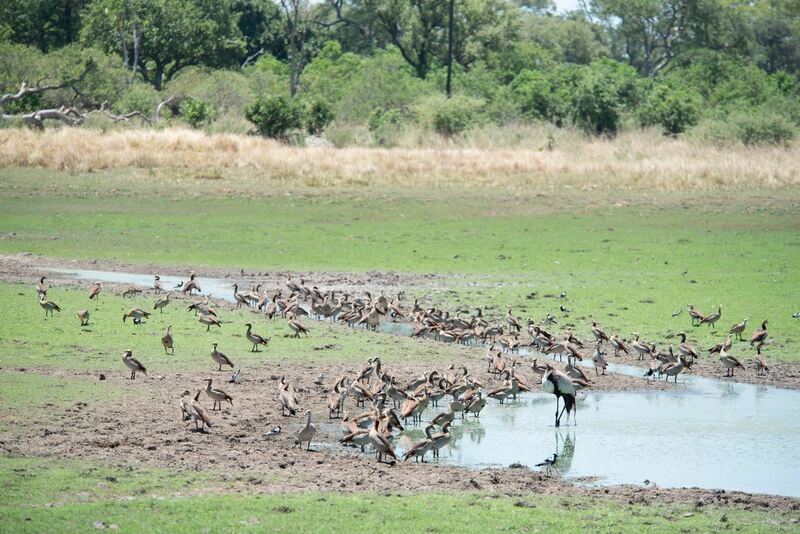 BIOFIN in Botswana seeks to facilitate for increased investments on biodiversity and close the resource gap. Review and Appropriately adjust protected Areas entrance fees. Introduction of a sustainability standard and certification (Eco-label) system for beef products. Increased retention of self-generated revenues by PA management authority. Enhanced benefits sharing from concessions in PA's. Enhancement and expansion of the Botswana Ecotourism Certification system. 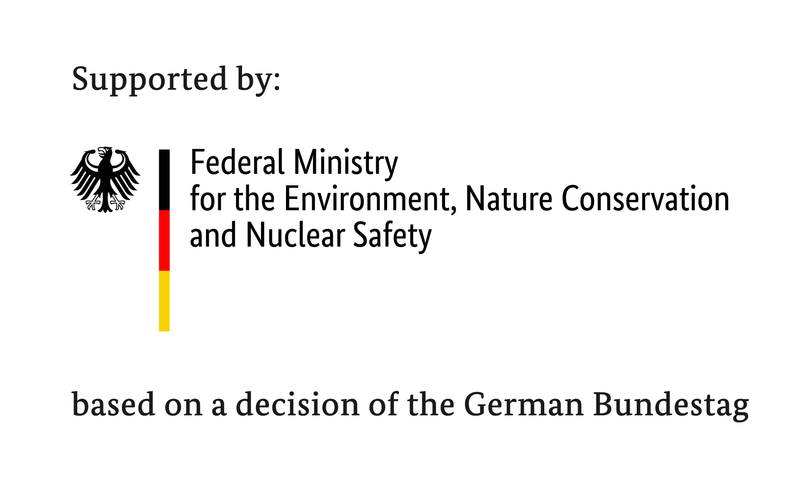 Introduction and formal integration of biodiversity offsets in to the Environmental Assessment policy and practice. Accessing global climate change funds for biodiversity. Ensuring adequate financial provisions/guarantees are set aside for unexpected mine closures. Re-orientation of subsidies and support for agriculture to make it more conditional on biodiversity conservation practices. The PIR has been completed and is being readied for publishing. The process included a review of the policies, legal instruments and institutional set ups for biodiversity financing. Through the PIR, Botswana has been able to identify the priority sectors of focus for BIOFIN as well as recommendations of some of the finance solutions for consideration. Good policies and strategies are in place to guide the processes, however, weak institutional mechanisms to support implementation, fragmented responsibilities, and resource inadequacies, centralised decision making which also results in the resource burden on the side of government. The expenditure review focused on the priority sectors as identified through the Biodiversity Policy and Institutional Review (PIR) namely, water security, food security and sustainable tourism. These priorities are primarily the responsibility of the Ministries of Land Management, Water and Sanitation Services (MLWS), Agricultural Development and Food Security (MoA) and that of Environment, Natural Resources Conservation and Tourism (MENT). Historic expenditures for these government institutions starting in the 2012/13 fiscal year, and for key NGOs, were reviewed and biodiversity-related expenditures were identified and analysed. Sources of revenue linked to biodiversity were also assessed with a focus on MENT. Total biodiversity expenditure was P 5.26 billion for 2012/2013 to 2018/2019 amounting to approximately 1.08% of total government expenditure. Average annual biodiversity expenditure for this period was P 751 million (see Table i). MENT is by far the largest spender on biodiversity amounting to P 4 billion which is equivalent to 67% of MENT’s total expenditure. MLWS spend the second highest amount, P 780 million which is equivalent to 5.6% of the ministry’s total expenditure, followed by MoA with biodiversity-related expenditure of P 489 million, equal to 3.6% of the ministry’s total expenditure. The total projected future government expenditure on biodiversity management in Botswana between 2019/20 and 2025/26, is P 7.6 billion based on past expenditure by MENT, MoA and MLWS, a “business-as-usual” expenditure scenario, and a conservative budget growth scenario. In terms of the six biodiversity management concerns, government biodiversity-related expenditure is projected to be split almost evenly between mainstreaming use (46%) and protection (54%). Total expenditure which can be attributed to six of Botswana’s largest NGOs were collected. In total, the NGO’s surveyed undertook P 210 million in biodiversity-related expenditure over the 2012/13 to 2018/19 period with overall expenditure growing roughly in line with inflation. This Finance Needs Assessment (FNA) serves to estimate the “finance gap” associated with implementing Botswana’s National Biodiversity Strategy and Action Plan (NBSAP). 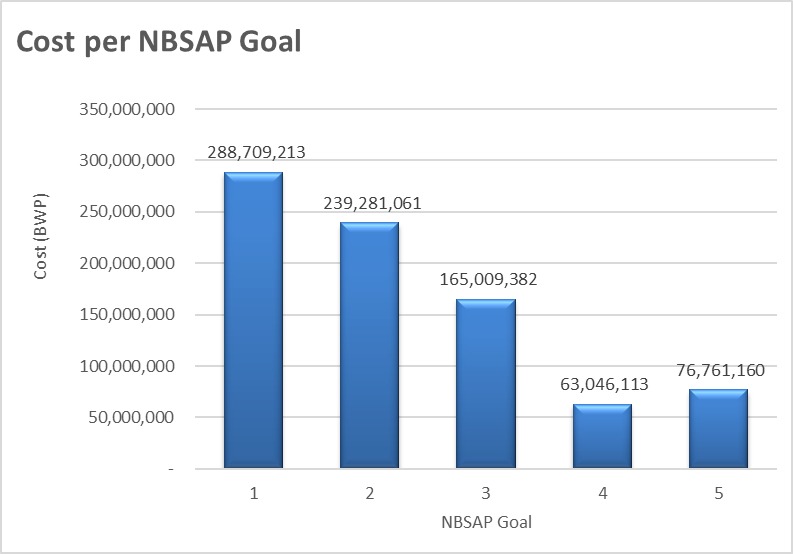 It therefore quantifies the additional costs associated with the implementation of the NBSAP’s strategies and actions. A programme-based approach to costing the actions was adopted for this process and the assessment was guided by the BIOFIN methodology. An initial list of 29 finance solutions has been compiled and subjected to a three step Screening and prioritization process during the week 08th -12th October 2018. An outline of the links between solutions forming an integrated Plan. (3) Ecological management and restoration. 11 finance solutions have been prioritized and technical proposals for all 11 solutions are developed to form part of the Botswana Biodiversity Finance Plan.